Charo is a famous celebrity personality and guitarist. 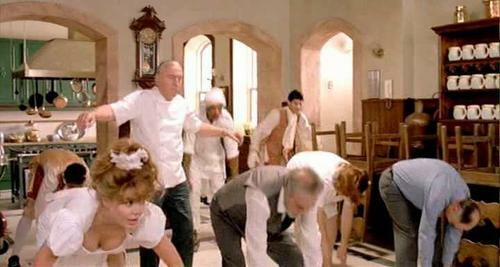 Charo wearing a low cut white maid's outfit as she bends over while talking to a guy who is sitting on the floor. Hi-res DVD capture from Moon Over Parador. 70's icon Charo exercising in a low cut white dress as she bounces up and down and then bends over briefly. Hi-res DVD capture from Moon Over Parador.